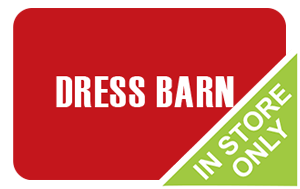 Give your wardrobe a boost by purchasing a discounted Dressbarn gift card! Just imagine: the clothes, shoes, accessories, and jewelry in the modern style and fit you love- for less money! With additional departments in plus size and petite, this is a fashion paradise for any lady! Finally, you can afford to look your best! The first store opened in 1962 in Stamford, Connecticut and the chain quickly grew from there. As of 2016, there were over 800 locations nationwide- which means you are sure to have one close to you! Buy your Dressbarn gift card at a discounted price and get more of the fashion you love for less money! Shop on-line or in-store, for the greatest new looks, without breaking your budget! Not only will your discounted Dressbarn gift card get you more quality fashion wear for less money, but because gift cards are a form of currency, all other store coupons and promotions remain valid! Be sure to check out their clearance and sales sections for sure-win items at discounted prices! You can also enter sign up for their newsletter and receive 20% off one regular priced item. Whether you shop online or in store, your discounted card will save you money on your entire purchase! Not only will a discounted Dressbarn gift card save you money, but Cards2Cash offers discounted gift cards for many other department stores you may know and love! Check out our listings for Macy’s, Nordstrom, Belk, Kohl’s, TJ Maxx and more! With Cards2Cash, looking great while saving money is easy! Do you have a Dressbarn gift card you aren’t going to use? Cards2Cash buys gift cards for many retailers! Not only that, but we pay the highest percentage rate possible! If interested, visit one of our retail locations for money for your card OR simply fill out our online form and we’ll get back to you with an offer for your card. Either way, Cards2Cash is your one-stop shop for saving money!